Mesoamerica was a geographically and ethnically diverse area that extended from northern Mexico’s deserts to northwestern Costa Rica’s dry tropical forests and included thousands of cultures united by similarities in religion, art, language, and sociopolitical organization. Some of the most familiar of these groups were the Aztecs, the Mayas, and the Olmecs. One of the common cultural traits found among many Mesoamerican groups is some form of writing system. Mesoamerica is the only place in the Americas where indigenous writing systems were invented and used before European colonization. The types of systems span a range from simple “picture-writing” to complex logophonetic (image and sound symbols) systems capable of allowing scribes to record speech and literature. All of the systems, though, share some core features that make them both visually and functionally distinct from other writing systems of the world. 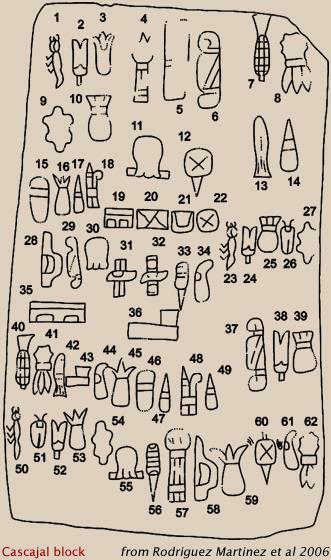 The most distinguishable feature of all Mesoamerican scripts is their intricate and pictorial signs. Some scientists refer to the signs as “hieroglyphic” because they resemble Egyptian hieroglyphs, but research is clear that the Mesoamerican systems developed completely apart from Egyptian influence. Still, the signs are often called “glyphs” because of the resemblance. Visually, Mesoamerican scripts resemble each other and share many similar glyphs because the glyphs, while stylized, resemble real objects such as animals, people, and natural features. Human body parts, especially arms and legs, are also used extensively; they represent either some form of action or verbs if they’re used in grammatical structures. Another feature found in all Mesoamerican writing systems is a common numbering system. For numbers less than 20, all scripts used a bar-and-dot notation, where a dot represented “one,” and a bar represented “five.” For quantities larger than twenty, different methods were used by different cultures. It’s easy to see, with such an advanced number system, why the sciences (particularly astronomy and time-keeping) were also well developed in Mesoamerican cultures; despite regional differences, all exhibited two interlocked time cycles. The first was the 365-day calendar, which was based on the movement of the Earth around the Sun. The year was divided into 18 “months” of 20 days each, with a five-day period at the end that was considered a dangerous and evil time. The second was the 260-day sacred calendar; it does not correspond to any astronomical cycle, but, according to modern Quiché Maya day-keepers, it represents the gestational period of the human fetus. This second calendar has no months; instead, it consists of two parallel, interlocking cycles of days, called “day signs” and “day coefficients,” with each day represented by a sign-number combination. Writing in Mesoamerica, unlike in other parts of the world, did not start for economic reasons (as a means of accounting). Instead, it had religious, political, and historical purposes. Whoever possessed the skill and leveraged it properly was seen as having higher social status than the average person. Such knowledge therefore reinforced the ruling elite’s claim to power. A highly elaborate and conventionalized symbol system appeared during the Early and Middle Pre-Classic periods (1500 to 300 BCE) throughout much of Mesoamerica. This meant that a knowledgeable person (such as a chief or a shaman) in one area could interpret symbols carved in another, and that regions could share complex ideas. Because of the similarities between scripts, many scientists believed an earlier writing system, invented by the Olmecs, had existed, and that it was the progenitor of all subsequent scripts. There has also been some conflict between archaeologists whether the uniformity of symbols was a product of Olmec influence (cultural, political, military, or a combination of these), or if the Olmecs were only one of the many advanced people during the Pre-Classic, all of whom may have played some part in the system’s development. Until recently, there was not enough physical evidence to prove or disprove any of the theories. In 2002, though, excavations conducted by Mary Pohl at the Olmec site of San Andrés uncovered a fist-sized cylindrical seal used for printing and two thumbnail-sized fragments of a greenstone plaque, both of which contain possible signs of a writing system. These items were archaeologically dated to approximately 650 BCE, which makes them some of the oldest examples of Mesoamerican writing and favors the “Olmecs first” idea. 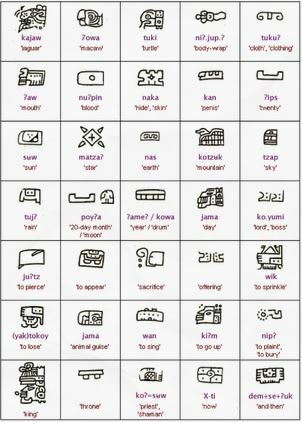 Research into the exact timeline and lineage of Mesoamerican writing systems is ongoing.